There are very few situations that can match the bond between a dog and its owner. Dogs are very much a part of the family that they belong to, and in some cases are treated like children. As a dog owner, you no doubt want the very best of everything for your companion. That includes everything from feeding them only high quality food, to making sure they get plenty of exercise, and even taking them to get groomed regularly. To do that, sometime it means loading them up into the car and going for a drive. Unfortunately, that means inviting all manner of craziness in to the car as well, in the form of hair, scratches, smells, and who knows what else. There has to be a compromise, but what can you do? The solution to this crisis is a dog car seat cover. Normally, this would be the part of the review stating that there is a whole world of options out there, and picking the best one ion your own would be a nearly impossible task. Luckily, that isn’t the case here. It’s kind of a niche market, populated by a handful of companies that know the the trials of pet ownership all too well. That doesn’t mean that everyone is the same. Far from it. Each car seat cover was created to tackle a specific hurdle, be it keeping the animal secure and comfortable, or protecting the interior of the vehicle from damage. So, for that, this guide has been created to show you ten of the best selections for your hard earned money, and highlight what makes each of them so good at what they do. By the end of it, you should have all of the tools necessary to make an informed decision, perfectly balancing your pet’s comfort and safety with maximum value. So, stating earlier that there aren’t that many car seat covers for dogs on the market may have been a bit of a misnomer. Sure, in terms of sheer numbers, the market is significantly smaller than that of other pet supply industries. However, what is available covers a wide range of styles, sizes, and seat types, so wading through everything can be challenging. To make it easier on everyone, let’s jump in together, and try our hand at finding the best car seat cover for dogs to match the needs of your beloved pet. Let’s start things off with a bang. This seat cover from BarksBar is designed for the backseat and gives you the choice between a hammock and a standard bench seat. As far as durability goes, this one is made of a heavy-duty waterproof polyester that is sure to last through many years of abuse, and the material has color-fast properties so that the cover continues to look great throughout each of those years. It’s big enough to cover a wide range of seats, and includes a flap extension for extra seat cushioning which is great in terms of versatility and comfort. On the middle part are Velcro openings for seat belts and seat anchors to keep your dog in place and prevent the cover from sliding. There are also two pockets on the front side, which you can use to store some pet snacks, food or play items. Machine washing is recommended but with the gentle cycle. This product is great not just for the price but also for the features that it has to offer. It has been tried and tested by thousands of users, and from the user reviews that we got, it is a durable product that does what it is advertised to do. On durability, seat protection, safety, and comfort, it is a commendable product. Considering this is a top-of-the-line car seat cover that was made with heavy duty fabrics to last forever, BarksBar designed a product that is very reasonably priced. Add in the strong focus on the comfort of the animal, and this cover exceeds expectations, making it an exceptional value for the biggest dog lovers out there. This may be a newer entrant on to the market from a largely unknown company, but it more than deserves its spot here on this list. In one fell swoop, they managed to put together one of the best shining examples of what a dog car seat cover should be. If this is what their early contributions look like, just imagine what we can expect down the road once they really get their bearings. As it stands, this is an exceptional cover that belongs in any vehicle that is used to transport the family pet. When it comes to dog car seat covers, of course the main focus needs to be on the well being of the animal. However, once that’s taken care of, most other covers leave it at that, and make no effort to protect the interior of the vehicle. Well, no more. 4Knines made sure that all aspects of protection, from the car to the pet, were taken in to account. This is one of those products that only comes around once in a generation, but manages to alter the direction of the entire market. With all of the features included here meant for the comfort and safety of the animal, as well as the protection of your vehicle, somehow the manufacturers managed to retain a high level of quality in the construction. The resulting product is one that the competition needs to take notice of. This cover seems to be having a bit of an identity complex. It’s clearly a high-end, high quality car seat cover with enough features to warrant a hefty price tag that would be completely justified. On the other hand, though, it’s also a product from a newer company that may not have quite the brand recognition that it deserves, and a lower price point would go along way to helping them gain steam. To remedy that, 4Knines opted for a very reasonable cost that instantly makes it a great value. Winner Outfitters is a company that has the benefit of being aptly named. Their car seat cover is easily convertible to meet all of the requirements to fit in the car, and is very well made. It’s been designed with multiple layers, including a waterproof top layer with a non-slip net banking. On top of that, the seat includes seat anchors, buckle straps, and side flaps to prevent it from sliding around. With all of these useful and innovative design choices, the company belongs at or near the top of every best of list, truly making them winners in the industry. It is lightly padded for comfort, and in the case of it coming ion to contact with any moisture, will quickly wick it away. Any surface dirt can be easily shaken off, and when it comes times to wash it, you can just remove it and throw it in the machine. When buying a seat cover, this first criteria every dog owner looks at is whether the cover puts the welfare of your dog above all else. This seat does just that, being designed in a way that every facet of its construction is meant to provide the safest and most comfortable ride possible. 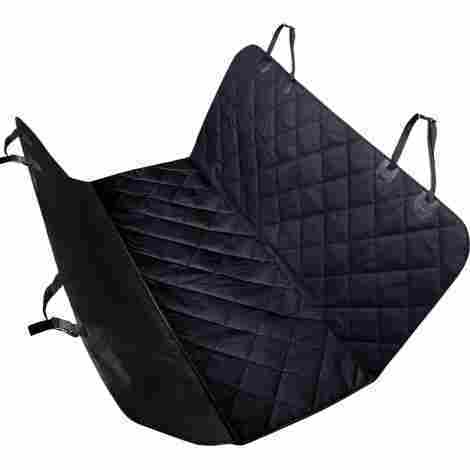 This dog seat cover is reasonably priced, putting right down the middle of the spectrum compared to similar models. Considering its exceeding quality and durability, including high levels of safety and security, it is absolutely worth the price. The fact that it also happens to be so user friendly just helps to guarantee its value. For the price and features, Accelerator has put together an exceptional car seat cover. It’s built for the long term, protecting your car all while keeping your best friend happy, safe and comfortable. It has a breathable, waterproof shell with a non-slip backing to keep everything as stable as can be. Because it is waterproof, cleaning it is a simple matter of brushing off any dirt, then wiping it all down with a damp cloth, and then it’s as good as new, back to providing optimum comfort for your pet. Acrabros dog seat provides your seat with superior protection, thanks to four heavy duty layers of material, each one serving a different purpose in keeping everything safe. The top layer is 600D oxford with waterproof stain block coating, quilted for unmatched softness and support., covering a thick, soft fill and 210D poly ripstop, fully breathable lining, topped off with a non-slip rubber grip layer. This car seat cover can do it all. It can be used as a hammock, or draped across the bench seat with the front flap to make it suitable for adults. Adding to the versatility is the fact that the manufacturers went with a universal fit, allowing it to fit a majority of models, as well as the ability to install it almost instantly. 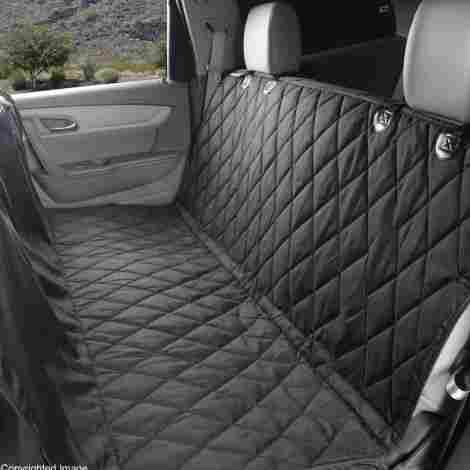 This seat cover is moderately priced, offering high end quality at a mid level price range. 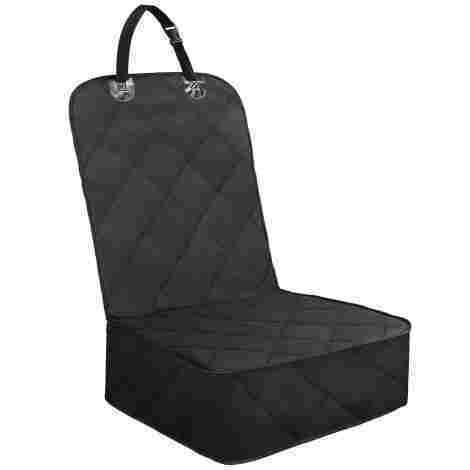 The features included quickly justify the price tag, and this seat is admired for its durability, high quality fabric, quilted comfort and safety measures. Anybody in the market for a no nonsense seat cover capable of withstanding any amount of abuse, this is the product for them. Yet another quilted car seat cover made to provide the highest possible level of comfort for your pet, this UrPower cover does everything it can to make that happen, while still coming in at a very fair price. This one is a rear seat cover that has been made to be big enough to fit the widest possible array of car and truck seat styles, so right away you know that at the very least it has a lot of versatility and functionality. For the price and the features of this product, it almost goes without saying that it is an exceptional buy that packs an enormous amount of value in to a light and compact shell. It will likely fit your car, whatever it may be, all while providing comfort for your dog for a very long time. So, what you’re getting is an excellent cover that packs a lot in to it. The middle part of the cover has a crevice that you can insert the seat anchor and belt to fasten the cover and the dog nice and securely. The cover can also be folded in with its Velcro, which is so important for portability and storage. It also happens to be very easy to install as it comes with adjustable quick release clips. This UrPower cover sits at a very easy price point, especially considering that it has all those layers of material that are waterproof, non-slip and padded. The size is more than enough to accommodate some of the largest dogs, and for that convenience alone, it is more than worth the money spent. This seat is outstanding and very much worth buying for so many reasons, all of which would take too long to list, but for an example, it is not the usual plastic shell, instead opting for with suede, polyester filling, and pongee materials. The manufacturer also went with these fabrics to help make it breathable, keeping air flow unrestricted while keeping odors and moisture away from your pet. After a while, when it finally does need to be cleaned, all you need to do is toss it in the washer any time. The underside of the cover is a strong plastic that catches all wetness and dampness. The middle part has seat belt openings that allow you to attach the seat anchors to your car’s safety belt system. The cover also comes with rip-resistant headrest straps and seat anchors. Most car seat covers for dogs concentrate on fabric quality and safety for the animal, and leave it at that. This is very important without a doubt, but the resulting product can leave something to be desired when it comes to aesthetic. Because, once you’ve guarantee the safety of your pet, why not add a little bit of personality to the backseat of your vehicle. The price is incredibly reasonable considering that this seat cover is super comfortable, attractive, durable, and very easy to maintain. It may look like it is slightly pricey, but that should not deter you from getting this cover, and, as an extension, all of the great features it has to offer. It’s a high end car seat cover that doesn’t cost nearly as much as you would expect. This one is a bit different, since it isn’t a rear seat cover, like the vast majority typically are. If you need a front seat cover however, then this Folksmate product is probably going to be your best pick. It does everything that a rear cover will do, protecting your car seat on three sides, due to its three side flaps. It also takes specific measures in place to ensure that your dog is as safe up front as it would be in back, and does not keep on sliding when you are driving. It is also a seat cover that you will not only use for your pet, but also for kids and adults. One of the most critical aspects of a car seat cover for dogs is that it needs to be easy to install, and stays in place without question. Imagine trying to wrangle your pet into a seat that doesn’t stay put. That’s a level of stress that’s just unnecessary. This seat installs in seconds, and won’t budge until you want it to. This Folksmate cover is a front seat cover made to fit all standard cars, trucks, and SUVs. It is made of heavy-duty, durable material 600D oxford fabric, A grade PP cotton, waterproof PVC and a slip-proof rubber backing, and contains three reinforced flap sides to give protection to the seat on all sides. This Folksmate seat cover, much like the majority of their products, is on the lower end of the price range. So, it is easy on the pocket, while not compromising quality in the slightest despite that low price. Being made of heavy-duty material that is comfortable, multipurpose, and durable really helps it perform at the top of its game for years to come. Dog lovers come in all forms, from all walks of life. If you happen to be in a place where you are a little tight on budget, and you want a great seat, then Honest Outfitters is an excellent pick. It is not just big on value, but on reliability too. It has unique features that allow a pet and a human to share the back seat, front side pockets for storing the dog’s ‘personal items’ and firm anti-slide features. Its waterproof ability even after repetitive use is another factor to consider. All in all, this is a cover seat cover designed for budget-conscious consumers with all of the features and performance of the higher end models. The zipper design allows you to modify the seat cover so that both people and pets can share the backseat at the same time. It is easy to install with accessories to keep it in place and prevent the dog from sliding. These built-in accessories include buckle straps, seat anchors, and sideslips. The cover is waterproof and remains so even after repeated use. This is attributed to the heavy-duty PVC coating. Also, the cover is anti-pet scratch and resistant to dirt. The cover is suitable for hand washing, vacuum cleaning and if there is no sufficient time, you can just wipe it with a wet cloth. There are also sewn bags on the front of the cover that you can use to keep dog toys and food. Honest Outfitters built this cover for every level of consumer, and as such is easy on your budget and still does not compromise the quality. It is firm, durable and functions just as advertised, delivering everything you could ever want in a cover for your dog. Exceptional value is the greatest feature of this cover. Bonve Pet seat cover is made of five layers of material to make it durable, soft and comfortable. The materials include 600D oxford for the surface, PVC waterproof coating, PP cotton filler, a non-slip backing and a polyester lining. All of this attention to detail on the fabrics alone betray the high standards that Bonve expects all of their covers to meet. The size of the seat cover is 54 inches wide, 58 inches long and 0.11 inches thick, making it ideal for most makes and models of vehicle. The cover has two backseat pockets to store your dog’s treats, food and drinks. On the middle part are Velcro openings and two adjustable nylon safety belts to keep both the dog and cover in place. This Bonve car seat cover is a favorite for many as it easily converts to a hammock. If your pet wants freedom and you choose not to fasten your dog to the seat belt, you can give it the freedom to roam in the backseat by simply zipping the side flaps. Moreover, the fabric is anti-slide and is padded for comfort. With this cover, your dog will ride freely, enjoy the change of scenes and your car will be protected. On the sides, there are flaps that protect the side of the car seat from scratch, fur, mud, and dirt when the dog is getting in or out of the car. The PVC waterproof coating prevents the dog’s pee, saliva or water from reaching the car seat. The cover is easily installed using four durable straps and clasps. 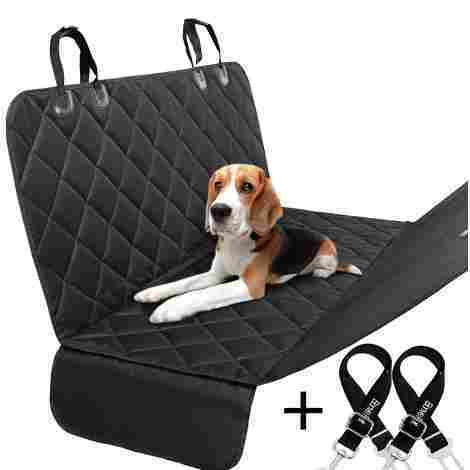 The straps allow you to keep the dog either in a hammock, strapped to the seat or in the car trunk. For cleaning, hand washing is recommended but if you insist on machine washing, pay attention to the clasps and seat anchors. Bonve Pets seat covers are going to be found on the higher end of the spectrum for car seat covers. However, you will not regret your purchase at all, and it will quickly be worth its weight in gold. The dimensional design, material uses, and safety precautions put in place, are all worth the price. This Mega Pet car seat cover allows your dog to have a better view through a viewing window, which is actually an outstanding feature that is not commonly found in most other seat covers. The window enables you and your dog to see each other and keep on interacting clearly. The viewing window has a mesh, thus allows free airflow to the backseat. Therefore, the car will not be stuffy. The cover has a seat belt opening, adjustable headrest buckles, sturdy hooks and seat anchors, to make the cover and dog firm when in motion. If you like keeping an eye on your dog, making sure that everything is all good during the ride, then this seat cover is an excellent pick. Its mesh window not only allows free circulation of air but also, enables you to see each other. It does not hold dirt or absorb unpleasant smells, and cleaning it has got no restrictions. It is comfortable, with a firm grip and super cozy for your dog. As a result, this seat cover comes highly recommended by reviewers everywhere. This car seat cover has a triple reinforced design with a waterproof polyester coating, soft polytech filling for comfort, 210D poly anti-rip lining, and a soft non-slip grip at the bottom, so you know it won’t be going anywhere for the next several years at the very least. It is also designed with two side flaps which you can fold down to protect the car as the dog jumps in and out of the car. The size of the cover is 59” X 53”, suitable for most cars. This size is also suitable for large dog breeds. The Mega Pet dog seat cover is yet another offering that is going to be in the higher price range compared to many of the other choices on this list, but it is a unique product can’t help but learn to appreciate the performance and value that comes with the purchase. The mesh window design, size, triple fabric layers, and durability all make it worth paying a little more for such a huge return. There you have it. Ten of the best car seat covers for your dog that the market has to offer currently. Since the number of options is limited somewhat, each existing product has to be at the top of their game, providing dogs with unmatched comfort, stability, and protection, while providing their owners with the confidence and peace of mind to trust that their beloved pets are well taken care of for the entire ride. What’s more is that there are a few companies that seem to no longer be content with being part of the pack, and are pushing forward with exciting and dynamic products all the time. This leave you, the consumer in a very good position to search out and find the absolutely perfect car seat cover that your hard earned money can buy. With each manufacturer being forced to up their game so as not to be left behind, quality and performance are only going to improve dramatically, while prices are most likely going to stay roughly the same for the foreseeable future. So, if you happen to be in the market for a car seat cover for your dog, there has never been a better time to check them out than right now. Manufacturers put much emphasis on the ability of each seat cover to resist wear and tear, dog scratches and constant dirt and fluid spillage, yet most consumers tend to take those qualities for granted. They purchase their covers expecting them to hold up indefinitely, but unfortunately there are several car seat covers available that just won’t be able to last. Durability is probably the most overlooked factor in determining the top of the line car seat covers, yet it so critical to the overall performance and value. So much so, that without good durability, all of the features and the lowest price points are rendered pointless, since the cover is unlikely to retain its integrity or protect the interior if your car. Luckily, most of the products provided for this buying guide have been chosen because they are so well -built, intended to take all kinds of abuse from the most rambunctious pets and keep going. Some of the more desirable requirements of a truly durable product are the strength of the fabrics and its water resistance. There is only a handful of fabrics that are chosen to be used in the construction of most car seat covers, and for good reason. In order to be able to withstand everything your pet can throw at it, the fabric needs to be breathable, waterproof, and tear resistant. To that end, synthetics such as ripstop nylon or polyester are typically going to be the most common. These are typically cheaper to produce and more widely available than their natural counterparts. The more breathable the fiber, the greater its ability to allow airflow, keeping your pet cool and dry for the entire ride. This also lets them wick away moisture and prevent stains and odors, while being very easy to clean when the time comes. As far as wear and tear resistance goes, these fabrics are naturally strong and durable, allowing them to last for a very long time without showing any obvious signs if damage. Water resistance is such a big factor because excess moisture can cause a whole array of problems. Fabrics that allow water to stay around can quickly become quite uncomfortable for the animal, and can also cause temperature and climate control issues. On top of this, moisture build up can cause staining to the car seat covers for pets, while also promoting the build up of bacteria that can result in some nasty odors. A lot of consumers, though they may be huge dog lovers, don’t know what to look for when buying a proper car seat cover. For whatever reason, they weren’t able to conduct the research needed to come to an informed decision on the matter, and when it comes down to crunch time, will often defer to brand recognition.strong brand reputation. Luckily, the market for car seat covers for dogs is not a very large or crowded one, with no clear runaway winner, though that appears to be on the verge of changing fairly soon. In fact, there aren’t that many manufacturers to choose from period, since the usual glut of knock-off brands hasn’t yet seemed to have popped up. Because of this, there currently is a pretty small handful of brands that most consumers pick from, each one holding a similar place in the market in terms of popularity and reputation. There are, however, a few brands that stand out from the rest of the pack. 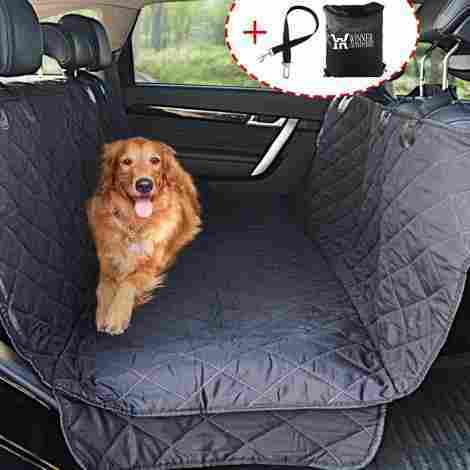 They do this by offering a higher end option of car seat covers, opting for superior fabrics and stitching to produce a more elegant cover for your pet. These tend to stand out, not due to better quality, but by an inherently higher price. In this buying guide, this high end subsection is represented by companies such as Mega Pet and Bonve. For the most part, the car seat covers put out by these brands are typically worth the investment, and if you’re wanting luxury for your pet, they should fit the bill nicely. Many of the other brands on this list, and indeed on the market in general, tend to position themselves right down the middle of the pack in terms of quality, performance, and pricing. This is by no means a bad thing, asa it gives consumers a wider range of reasonably priced options that are guaranteed to protect and comfort your pet for many years. Each of these brands still put a lot of attention to detail in to their seats, and none of them compromise quality in any noticeable way. Since these car seat covers are so similar, this also helps to keep the market competitive, meaning that prices for each one will never vary too greatly, and the overall price point will always be at least somewhat reasonable. The one major drawback for this, however, is that consumers are denied any real innovation or fancy features that would distinguish the brands from each other. Because there are so many brands fighting for the same piece of the pie, there is very little room for experimentation, and in the rare event that a new feature or design does manage to make its way in to one of the covers, it is quickly copied and imitated by all. As mentioned up above, the landscape of the car seat cover market is poised to change pretty soon, as there are a couple of brands that are continuously managing to stand out from the rest with each new cover they produces. These covers push the boundaries of what a car seat cover should be, and how it should protect your animal. These are the products that usher in new innovations, designs, and features, while managing to keep the price points in line with the rest of the pack. Some of the most recent notable advancements in the industry from these pioneers include wide mesh windows that promote airflow while giving the animal maximum visibility, and antimicrobial treated fabrics to eliminate the possibilities of odor buildup. These brands, if they continue on this path, will quickly become industry juggernauts, setting the standards that the rest of the companies will have no choice but to follow. The two major players in the fields currently are 4KNines and Bark’s Bar. Surprisingly, there isn’t going to be all that much to talk about here. Sure, there is going to be at least some variation in cost from one cover to the next, but for the most part, not a lot of disparity exists from brand to brand. Also, in terms of the overall price, it isn’t very high. It has already been discussed a bit up above, but many of the brands that manufacture car seat covers stay within a certain range as far as price, quality and function is concerned. None of these companies stray too far from the currently established standard set by years of competition. This has the effect of keeping the prices range in this group very narrow. As a result, each of the products made by these companies are little more than clones of each other, with each using almost identical fabrics and stitching techniques, and providing the same features. While this is great for the consumer, it is a bit boring, and runs the risk of the industry stagnating, potentially robbing buyers of better quality and design choices. Besides a few selections in the high end range, for the most part, prices for these covers have been fairly similar across the board. However, there has been a few companies of late that have challenged convention, opting to squeeze as much out of their products as possible while still being able to keep them affordable. These brands go out of their way to make covers that are high quality, yet very accessible to the general public, and are quickly becoming the unparalleled leaders in their industry. As far as the actual price goes, most car seat covers for dogs will range from just the hundred dollar mark for the most basic version, to several hundreds of dollars for the top-of-the-line models, depending on certain factors such as materials used, the level of restraint needed, and other, more cosmetic features that may be included in the product. Still, in between this range you’ll find a large assortment of covers designed to meet virtually every need and situation as required. Car seat covers for animals have been around for decades now, but have only recently garnered any real level of popularity, with more and more people becoming dog owners, and therefore needing some type of solution for transporting their pet. As such, in the past, the market was devoid of manufacturers, and the lack of demand didn’t allow the companies that did exist to charge too much for such a niche product. Over the past couple of decades or so, however, the demand has been soaring, and now there are new companies throwing their hats into the ring and producing car seat covers every day. For the time being, though, the prices have remained pretty static, and a very good quality cover can be had for relatively cheap. Since owning a pet, especially a dog, has become such a necessary part of life, consumers can expect a couple of things to happen with the cost of pet supplies. With demand so high, until the supply catches up to a point where products are readily available to consistently meet needs, prices will begin to steadily climb, possibly to levels that have yet been seen for pet products and accessories. Once that does happen, however, more and more upstart companies will start to flood the market and over saturate it, which will then in turn drive the prices down for the vast majority of brands, forcing them to compete with inferior products in order to stay afloat. Eventually, prices should balance out, and the resulting market could very well hold steady at a price point that is significantly higher than what it is now. ASPCA: The American Society for the Prevention of Cruelty to Animals. This is an organization dedicated to promoting the safety and well-being of all animals, especially those kept as pets. Because their mandate is so concerned with safety, a lot of the products that are designed for animals is going to come under close scrutiny by this group. At times, manufacturers will create products in cooperation with the ASPCA in order to ensure they meet up to high standards. 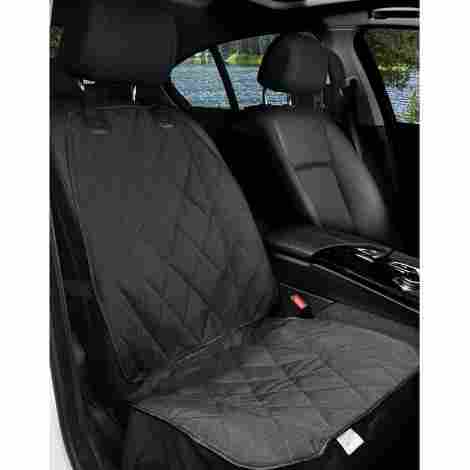 Bench seat cover: This is a type of car seat cover that is designed largely to fit bench style rear car seats. These ones tend to be long enough and wide enough to provide coverage for the entire seat, while some leave openings for the seat belts to come through in the event of humans riding in the back. 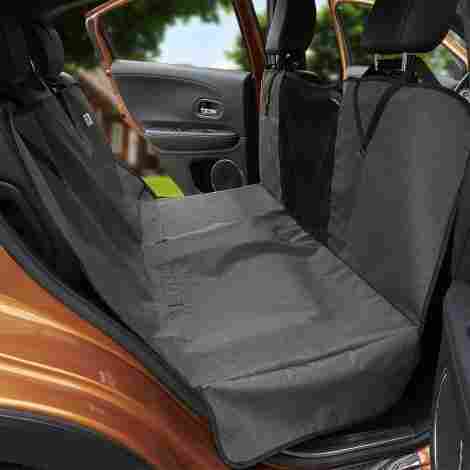 Bucket seat cover: These car seat covers are smaller, as they are designed to fit over single seats, either in the back or, alternatively, up front on the passenger seat. Cargo cover: Cargo covers extend to the back of SUVs, wagons, and other styles of vehicle, and are used to protect any possessions and valuables that may be stored in the car. These are often standalone items that are separate from car seat covers, but there are some products that incorporate both in a single cover. Crew cab cover: These covers are intended specifically to be used with the seats found in the extended cab of a truck. These covers are necessary because the dimensions of an extended cab differ from that of the back seat of a car, so a more customized size and fit are required. GSM rating: This is short for Grams per Square Meter. It refers to standard measurement of all fabrics, and denotes the density of said fabric. The higher quality the fabric, the higher the GSM rating tends to be, although, in the case of car seat covers, this may not always hold true. A lower GSM can be beneficial in this case because it means the fabric has a greater ability to wick away moisture instead of absorbing it. The higher GSM numbers are generally reserved for better quality towels, which are often heavier and softer than normal fabrics. Hammock: Traditionally, a hammock is a bed usually made of a canvas or other similarly sturdy and durable material that is suspended at both ends. As far as hammocks for dogs are concerned, this tends to be a type of car seat cover that is stretched across the back seat of the vehicle, allowing the animal to be comfortable and unrestrained while still protecting the car’s interior. 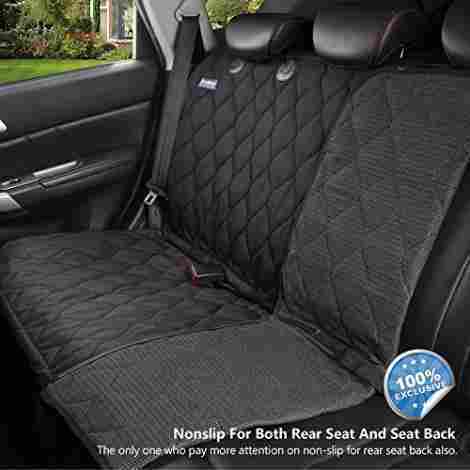 Non-slip backing: This is a layer of material, usually made of rubber, that is affixed to the back of the car seat cover to prevent it from moving around and becoming dislodged when the dog is occupying the back seat. Piped edges: This is an embellishment that is often a strip of fabric folded so as to form a pipe like structure, that defines the edges of the fabric. 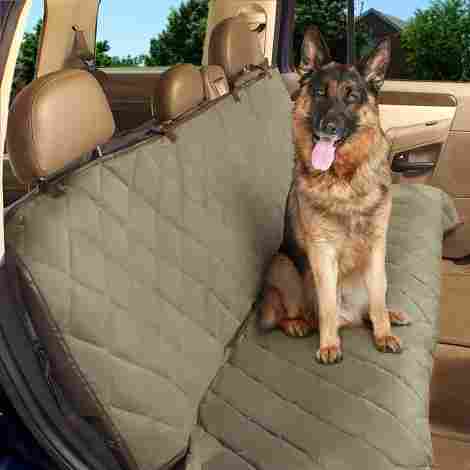 This is used on car seat covers to strengthen the stitching as well as to help prevent any liquid from spilling over the edge of the cover, most often in the event that the animal has an accident during the ride. Polyurethane: Polyurethane is a very common type of synthetic resin that is commonly found in an enormous variety of everyday items, such as insulation, mattresses, car parts, etc. Polyurethane is so popular because it is a very durable, versatile plastic, that can be made either rigid or flexible, depending on the application it is meant to be used for. For car seat covers, this is a popular choice because it is strong, naturally water resistant, and can hold up toi a lot of abuse for a long period of time. Polyurethane is found in some form on most car seat covers. If it isn’t used as one of the materials in construction, it can usually be found as a waterproof coating on the cover to give it extra resiliency. 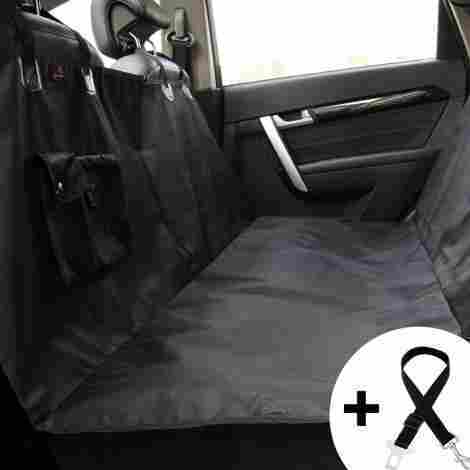 Split-rear cover: A split car seat cover is used for rear bench seat in vehicles that have a 60/40 split. In other words, these bench seats allow the either one or both backrest to be folded down to provide extra storage space. These car seat covers are designed to accommodate this feature. UV protected: This is the fabric ability to resist UV radiation from penetrating into them and damaging their integrity. UV rays are a leading cause of degradation for fibers because they activate the polymer molecules and cause them to break down. Over a prolonged period of time, UV exposure can cause significant damage, leading to the fibers getting faded or in some cases, breaking down and being destroyed. For car seat covers, the most sensitive areas are the protective straps that are used to secure the cover into place and provide stability for the animal during the ride. Many manufacturers take extra precautions to prevent this by giving their materials a UV coating that prevents any radiation from coming in to contact with the fibers, thereby preventing degradation. Q: What are the seat covers made of? The majority of the better car seat covers are going to be made primarily from a heavy duty synthetic material has both waterproof and breathable for the outer shell, with the top most part that comes in to contact with the animal being padded with a quilted covering for added comfort. The back of the cover is then affixed with a rubberized non-slip backing to prevent the cover from sliding around while the car is in motion. Q: Will all car seat covers fits all car seats? Not all car seat covers are made to fit every make and model of vehicle. Since there are so many on the market, having a universal car seat cover that fits every single one would be virtually impossible. It would require the cover to be much too large, making it unusable for smaller seats. For the most part, however, a standard size car seat cover will easily accommodate a large variety of domestic models, including trucks and sport utility vehicles. For vehicle that are not compatible, most manufacturers also produce larger versions of their car seat covers. Q: Can car seat covers be machine washed? Yes, for the most part, all car seat covers can be machine washed, but it is recommended to only use the gentle setting, otherwise you can run the risk of damaging the cover. Generally speaking, though, unless the cover is exceptionally soiled, it’s probaly a better bet to refrain from putting the covers in the wash, and use other methods to clean them instead. Usually, most stains and dirt can be easily removed by first shaking off the car seat cover, and then scrubbing any stains with soap and water. For harder to remove dirt, you can then spray the cover with a garden hose and hang it to dry. Because of the waterproof and breathable nature of car seat covers, it should be very rare that they would need to be cleaned any more thoroughly than this. Again, if you are going to put them in the washing machine, be very careful to only have them in for as long as needed and try to avoid the use of chemical detergents if at all possible. Q: Will using a car seat cover restrict the seat belts? If the car seat cover is just casually thrown over the seat, then yes, use of the seat belts will be restricted. Pretty much all car seat covers available for sale today are designed to have slits cut out to allow you to slide the seat belt through in order to gain access to it. Q: Can people sit on the covers? Human passengers are able to sit on car seat covers meant for dogs, though this may not be the most comfortable option. Fortunately, many manufacturers are now designing their seat covers to be able to comfortably house any manner of passenger, allowing easy conversion of the covers, or just making them more versatile and comfortable in general. Q: Why do I even need a dog car seat cover in the first place? Dogs are playful creatures, and therefore like to bite, pee and jump around. So it goes without saying that dog seat covers are essential to avoiding damage to your precious car seats. Also, it’s very easy to clean in case your pet has an accident while riding in the vehicle, which is world’s above not using a cover at all, which is just asking for trouble. That being said, it’s probably a good idea to choose a car seat cover for dogs that is waterproof, in order to prevent leaking through to the seats. Many of the higher quality car seat covers for dogs are made with a rubberized backing that prevents the animal from sliding around during travel, which helps prevent injury, especially for the more active and rambunctious dogs. As well as slip resistance, many of the materials used will offer features to ensure that the dog feels warm and comfortable, while also taking care that the car seat cover is correctly fitted and installed to avoid it from coming off and potentially causing a problem while driving. After a lengthy road trip with your furry best friend, the back seat of your car can look like a disaster area, with all the fur, stains, and scratches inflicted on to your seats. With a car seat cover, there is no need to worry about r interior. In fact, cleaning the cover itself is a non issue, as it can usually be shaken or sprayed out and is then good to go. When a bit of effort is required, the better car seat covers will need only soap and water, leaving you free to stay away from the harsh chemicals that could consequently harm your pet. Dog’s tend to shed pretty much constantly, and can easily get on to fabrics, attaching itself to any available surface. This can be very tricky and time consuming to get out, and because car seat have many recesses in them, completely removing dog fur can be impossible. Using a car seat cover is not only important for the safety of your dog, but it can also help prevent their hair from getting all over the place. The hair will cling to the cover, which can then be easily removed and washed as needed. Without a car seat cover, the only other alternative is a costly detailing. Unlike the traditional yet archaic practice of transporting dogs in crates, specialized car seat covers for dogs give more space and freedom for the animal during movement in the car. Some covers are convertible to a hammock design that gives the dog freedom of movement and safety. In general, car seat covers allow the animal to have the entirety of the area of the seat to move freely in, with the exception of needing to secure the animal in place using belts and straps. Carid- Which Seat Cover Fabric Works Best For My Needs? Neoprene Seat Covers- How to Clean Neoprene Seat Covers?